The dam at Walton's Mill Pond Park in West Farmington. 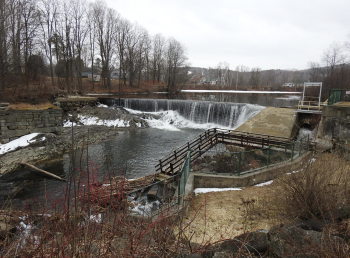 FARMINGTON - Voters approved a project to remove Walton's Mill Dam by a relatively wide margin at Tuesday's referendum vote, accepting approximately $1.2 million funding from the Atlantic Salmon Federation to take down the structure and make associated improvements. The single local issue on Farmington's ballot was approved with 2031 votes in favor of removing the dam and 1195 opposed. The yes/no question allowed the town to enter into an agreement with the ASF to remove the dam on the Temple Stream. Built around 1820, the dam was flagged as a barrier in the migration route of the endangered Atlantic salmon by the National Marine Fisheries Service in 2009. The agreement would result in the removal of the dam at the estimated cost of $500,000; improvements to the area that included more parking, wooden walkways, a public restroom, a pavilion, trail improvements and historical preservation elements, at the cost of $355,000; $20,000 for future park maintenance costs; and the replacement of two culverts on the Clover Mill and Cummings Hill Roads at the combined cost of $350,000. Per the referendum question, no town investment would be used for the $1.2 million project. Terms and conditions will be negotiated by the Board of Selectmen. ASF had previously indicated that the removal of the dam will not occur immediately, as the organization would need time to raise the funds. Town officials had previously been told that federal action on the dam would be delayed as long as the town was actively pursuing a solution. The town's alternative option to mitigate the barrier issue would have been to install a fish passage to allow salmon to bypass the dam. In addition to constructing the passage, the dam itself would have required repair to make it safe for the installation. The combined cost of the fish passage option was previously estimated at $750,000. oh! I can't wait to land my first Atlantic Salmon in these waters. For those who voted to tear down the dam. DO NOT EAT ONE THING FROM TODAY til you get your first Salmon Dinner out of Temple Steam. You could get very hungry before then. To bad all homes surrounding this area will loose their beautiful backyard environment. The twerps got their way. 50 years from now,,,, they'll be long gone and the only salmon will have developed legs. Roll the eyes and move on. Wow Big Salmon pushing their dam agenda down the gills of the gullible libs of FARMington. I for one will be joining Nancy in a food strike that will end ONLY once this vote has been overturned. Are ya with me Nancy? Not one bite of food. Let our starvation and eventual demise and decomposition fertilize the crops of FREEDOM! We will not just welcome our new salmon overlords sitting down! We will call people names like Done Deal, we will use ALL CAPS like Nancy, we will wipe off our milt mustaches and tell those scaly fish monsters to GO HOME. Signed, so called “elite Salmon”. Though from a fiscal standpoint, this vote means the town of Farmington does not have to pay to build "fish ladders" to keep the dam viable. The money to remove it comes from somewhere else. So at the very least, this seems good for Farmington taxpayers. Removing the dam was/is a no cost, no brainer! Unfortunately, those against its removal were "no brainers". @curmudgeon a "no brainer" is someone who blindly follows without researching what it is they are voting for. This was a strong arm tactic by the Salmon Federation and the our town leaders were too scared or intimidated to do some homework. That dam is a low risk dam, that is not currently in danger of collapsing. Interestingly the salmon only run in the fall and a portable ladder was not even discussed. It could have been in place and removed after the run. Now an entirely new ecosystem will be lost, and some biologist are now saying because of the science was done before the dam has been removed, these factors may change once it has been removed. Salmon may never actually ever swim up the stream, but then again we can go on blindly be told what we should do. That is being a "no brainer". curmudgeon, you are missing the point. The people against the dam know about the plan the evil fish lords have to take over the area. They are not no brainers, they are heroes for trying to protect us from an invasion by the evil Salmon. Everyone needs to start to grow gills as eventually, we will be an underwater society. The fear is real!!!!!!!! Galen, you miss the point. Removing the dam saves the town money! Also, you don't give much credit to the town officials. Don't think that you are the only person capable of considering facts and analyzing data! I stand by the "no brainer" comment. Thank you Conspiracies - finally someone who GETS it. Climate change is a liberal/Chinese/immigrant hoax but the impending salmon takeover of Franklin County is oh so real. Us big brained repubs need to keep pounding the bone broth and praying the in general direction of Alex Jones our lord and savior. BTW Nancy and I are on day 2 of our food strike. Going very very well. Take that Pelosi. As grandpappy used to say "Why buy the salmon when you can get the milt for free"
" The is no such thing as a free milt. " Conspiracies and Elvis, I am not sure what you are referring to but climate change is exactly why the salmon will not stay in Temple Stream. Temple Elvis - I am with you brother. No more food as the fat ones will be eaten first when the salmon take over. People may laugh and her posts but a hunger strike is brilliant. I am surprised Lord Alex of the vitamin water did not instruct us on this first. Forget the Southern border and shoe less children bringing their dirty diapers (ISIS style chemical attacks) to the US. We need 100,000 armed troops here in Franklin County to stop the very bad, very bad fish. The women don't want them and the men don't want them, but the women especially don't want them. We need to revoke all citizenship any salmon have. Forget the dam. Lets build a wall and get the salmon to pay for it. I believe that is one of the founding principles of the New Constitution. Stay strong during the hunger strike Elvis.Stay vigilant and stay alert. Together, we shall prevail as we have History and God on out side. Side note, I will be selling the ever popular aluminum foil hats at Chester Greenwood day. This year I am adding a neoprene version that blocks the fish from reading our thoughts. The dam attracted people to the area in the 1st place . So if there is no dam , why is it necessary to have a park with a new pavilion , better trails , new bathroom , better parking and new wooden walkways . It doesn't make any sense to me . Oh yeah ! it will be to catch all those Atlantic Salmon migrating up the Temple Stream . Looks like Goliath smote David this time. The whole situation goes to show how little local control we truly have. Good to see some like minded folk on the DB Mr (or is is Ms?) Conspiracies. I remain steadfast in my hunger strike and apologize profusely to King Alex of the Jones for I have also given up his life giving vitamin water. I will humbly admit that in a moment of weakness I did dab some bone broth on and about by gums but I did not take the bone broth to 2nd base and was able to resist further temptation. In addition to my normal order of tinfoil hats I will also need a special request this year. I suspect with the upcoming battle against the evil, dirty, salmon migrant caravan I will be requiring a codpiece. If it is not a hassle please us Reynolds brand foil - not the cheap stuff. (My wardrobe malfunction at last years RNC convention caused quite the stir!) Size extra small. Elvis, it is Mr. (although these days we have to be careful with labels or else we will be brandished as radicals). Good news on the codpiece. We have a model in stock that is extra, extra small. We call it the Spray Tan Donnie. For some reason, we had record sales of it at the RNC meeting this year. My booth will be embedded with the radical politicians as I like to keep close tabs on my enemies. Certainly, we are not alone in our concerns as many good posters in the DB (I love the irony of that abbreviation) clearly espouse many of our same theories. Readers, wake up. Salmon are evolving at an alarming rate. Just watch the video of them crossing the road in Canada. This is man came about when the first fish made it to land and developed lungs. We must build that wall at the Northern border. I read a story on Breitbart recently that talked about a generics lab in Canada that was altering salmon DNA so Canada could have a larger population and take us over. The "fake" news will of course refute this video and try to show how it has been altered but we all know the truth. Recently, a cod at the New England aquarium was heard saying "Today Farmington, tomorrow Skowhegan" We all must wake up and stop the rise of the fish lords. Lest establish a militia and we can muster regularly. For food might I suggest bagels and lox?